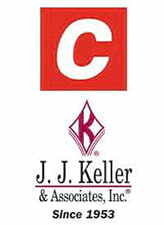 J. J. Keller's implementation support simplifies compliance with the ELD mandate for auto transporter. Neenah, WI -Cassens Transport, an auto transporter based in Edwardsville, Ill., is nearing completion of the full implementation of J. J. Keller® electronic logging devices (ELDs) in advance of FMCSA's December 2017 ELD mandate deadline. "We've long been committed to compliance and safety," said Jay Mitchell, quality compliance manager at Cassens Transport. "J. J. Keller is making complying with the ELD mandate easier than we imagined thanks to the simple ELD installation and their driver-friendly ELog application. With the help of their implementation support team, we've installed ELDs in all 1,500 of our vehicles in under nine months — three months ahead of schedule. And 95 percent of our drivers are now running completely paperless." The ELD mandate requires most motor carriers in the U.S. to have a compliant ELD installed in their commercial motor vehicles by December 18, 2017. This regulatory change is intended to ensure that commercial drivers are accurately tracking their record of duty status in compliance with FMCSA's Hours of Service regulations. For more information about the J. J. Keller® Encompass® fleet management system with ELogs, visit JJKeller.com/ELogs or call 855-693-5338. Headquartered in Edwardsville, Ill., Cassens Transport Company is one of the largest transporters of automobiles in the United States. Established in 1933, Cassens now employs more than 1,400 Teamster drivers, 150 shop personnel, and over 250 other support people. Each day, Cassens' fleet delivers up to 10,000 vehicles for 15 domestic and international automobile manufacturers. For more information, visit Cassens.com.